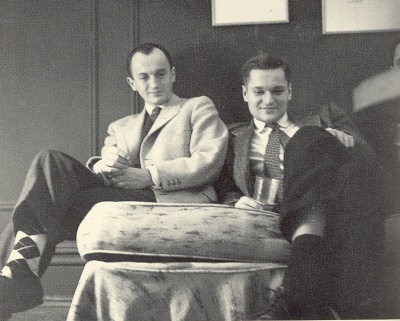 Frank O'Hara was, by all accounts, a very social person. With a wide circle of friends, some intimate, many familiar. As an active member of the New York art and literary scenes, he met or came into contact with hundreds--thousands, probably--of people, many important or noteworthy or interesting. Frank was voluble, and charming, and forthright. And very emotional too. One of O'Hara's best and most famous poems, "My Heart," proposes a concept of poetry that is "open." What might it mean to claim that the best part of one's poetry is "open"--as opposed, then, to closed? What exactly is O'Hara telling us about his poetry, about himself, and possibly about how to measure the best qualities of our poetry? What might "open" mean as a quality or descriptive in verse? I've thought about this for years. Once upon a time, I might have said (or thought) that O'Hara strove in his poems to engage the reader with a greater jeopardy or vulnerability, to "bare" his private soul, thereby bringing himself closer to the reader (his audience). Does an "open" poetry imply intimacy with the poet? Might it imply a favorable kind of embarrassment of this intimacy? As with many typical O'Hara poems, the argument begins almost at random. The poet declares that he must be various--"I'm not going to cry all the time/nor shall I laugh all the time." And goes on to describe himself in terms of a dialectic between one extreme kind of behavior or another. This is another way of saying that he's unpredictable, and that this unpredictability is a hallmark of his character. This variability is clearly seen as a favorable aspect. Interesting people aren't predictable, or at least this particular writer isn't; and he places a value on that. Unpredictability. Then, suddenly, at the end, he catches himself in mid-sentence, starting to describe his heart, he qualifies it--"you can't plan on the heart"--which is really just a way of restating the premise of the poem (predictability), and says, instead, "but/the better part of it, my poetry, is open." It's as if he had been going to say "my heart is open" but instead decides that it isn't his heart that is open to the reader, but the poem ("my poetry"). The surprising line comes across like a declaration of principle, almost a poetics. Once upon a time, again, my first tendency would have been a confirmation of how I thought about O'Hara's verse, which always seemed, in its difference, to be about the casual familiarity of direct speech, against the rhetoric of poetic style(s). O'Hara's poems, after an early period of more doctrinaire writing in the early 1950's, seemed more and more to assume the flamboyant and giddy spirit of party-talk, the kind of idiomatic language and candor of personal conversation. O'Hara showed how you could build an otherwise traditional poem out of ordinary contemporary speech, touching all the bases, while going naked. There was even a notorious anthology, Naked Poetry [New York: The Macmillan Company, 1969. Edited by Robert Mezey and Stephen Berg], whose title became the catch-phrase for the negligent unfettered "free" verse of the post-War era. "Naked" might have seemed attractive as a description to some, while others may have seen it as the beginning of the end of good poetry as they defined it. Any poem "going naked" into the world might have had a certain original purity, but it also implied a naive misapprehension of what well-written poetry was supposed to be. But over the years, I've come to question what my initial impression of that "openness" might mean. When we think of open, we might describe it as a sort of welcome mat. Come in, everyone is welcome here, no one is excluded. No reason to feel that poetry is an exclusive club with specific requirements including a strict dress code. But how would we go about describing this "open" quality in terms of poetic function? What constitutes a "welcoming" style versus an unwelcoming one? Would we describe a poet who was very popular as being more "open" to his readers than a poet who was obscure. In what sense does O'Hara mean "open"? Can a poem open outward, to encompass the world, or other people, while another poem, tightly wound inside itself, actually put readers off, push them away? Whitman, relevantly enough, was a poet who actively sought to encompass his readers in a large democratic embrace--it was an article of faith in his work. Eliot, on the other hand, often seemed to create a very limited vision of his world, one neither welcoming nor cheerful, designed to separate the poet from the rest of humanity. In his criticism, he was often so straight-laced and buttoned-up that he seemed to be a gloomy English schoolmaster slapping his readers on their wrists for not knowing what he knew and they didn't. The influence of Eliot and the academies throughout the period from 1900 through about 1955, insured that the prim and proper poem, serious and committed to traditional modes and tropes, would be the standard in the periodicals and the world of publishing. O'Hara's poem--and his declaration here--had by the time of the poem's appearance become almost a cliché of the New American Poetry. Other poets of the period--Whalen, Creeley, Eigner, Schuyler--had already been writing what we'd then (and now) describe as a poetry of greater "open-ness" and variability. Would O'Hara's "open" statement have been construed as a description of what his poetry did, differently than, say, what Robert Lowell or Richard Wilbur or Donald Justice did, circa 1960? Hadn't Lowell previously "opened" himself to intimate autobiographical disclosures during the 1950's in Life Studies and For the Union Dead? In what sense might Lowell's thawed-out disclosures not in fact been "open" gestures towards his audience of readers, in the same sense as O'Hara's talky, wise-cracking, swishy overtures were? Or was O'Hara's proposal of an "open" poetry merely an illusion, constructed on the fly? There are different ways of configuring O'Hara's dichotomy of open/closed. Would a poetry restrained by elaborate grammar and strict fixed verse forms be construed as closed? Would its "closedness" be defined by its style, or by the numbers of readers who responded unfavorably to it? Or would a closed poetry be one in which its syntactical violations were so numerous and radical that it put its readers off? Is Joyce's Ulysses a closed writing, or an open? Is openness to different, even radically different, ways of writing a fulfillment of the descriptive? We think of grammar and syntax, as aspects of a system, which grew up through oral transmission and was then conditionally "fixed" with dictionaries and grammars, but which continues to mutate in the marketplace of communication. We think of grammar and syntax and spelling and so forth as aspects of the accepted grace of consent. If the foundation of language exists to restrict the range of responses to language and present reality, might that edifice be subject to invasion and restructure? How might we go about renewing our sense of what it means to communicate, relevantly and immediately, to the facts of our personal lives, or to the facts of our present political realities? Would such a program be about finding new ways to employ words, and the structures we make from words, or would it be a more successful effort to "communicate" (or reach out) to a larger and larger audience of readers? Are these two approaches mutually exclusive? Does a writer such as Shakespeare in fact bridge these two continents, by making persuasive dramatic analogues in a language as lively, inventive and powerful as any we know? Is Critical Mass reaching Critical Mass? When I was a kid growing up in Napa California during the 1950's, I had a paper route for four years, starting when I was 10. My route covered 12 suburban blocks, in the hills of Alta Heights, and totaled over a hundred customers. I had to roll the papers up with rubber-bands, put them into two big canvas bags which I wrapped on my handlebars, and pedal round the neighborhood, throwing the rolled papers onto lawns or porches. It usually took about 90 minutes to complete. I had to do it six days a week, and there was no back-up. I had gotten my first bicycle a year earlier for Christmas, a big, green and chrome model with a little horn and a passenger rack over the rear tire. Some of that stuff came off when I started the paper route. In those days, adults didn't ride bicycles, at least in suburban America. Kids and teenagers did, but riding a bike above the age, say, of about 13 was considered childish, and was definitely un-cool. In the 1950's, we were living in the midst of the Age of the Automobile, which had transformed America, bringing prosperity and convenience, making America the richest nation in the history of the world. The suburban paradigm, which grew up during the 20th Century, was based on the automobile, allowing people to commute and travel with ease. The automobile became king, with a whole cultural franchise built around the ownership of brands and the glorification of driving. In large urban areas the automobile eventually caused congestion, and our huge freeway and hiway system, built to facilitate and accommodate the four-wheeled vehicular traffic, got bigger and bigger, often becoming inconvenient, and dangerous, rather than efficient and fun. For better or worse, cities and roads have become the province of cars. The shopping center was invented for them, and whole districts of our cities and towns were designed to serve and exploit the car economy. The automobile paradigm caused a reaction among city planners and regional administrators. Looking to Europe--which developed and evolved over two thousand years in the pre-automobile era--they proposed to de-emphasize the automobile, turning some downtowns in America into auto-free zones, thinking or believing that this would lead to the sort of delightful and pleasant scenes one sees in England, or France, or Italy. The failure of the "European" urban pedestrian paradigm, as a forced-fed alternative to the automobile, was immediately apparent. These cute little pedestrian districts mostly failed, because they didn't address the central fact of American life, the car. People shop in cars, they recreate and visit and travel by car. Cars are indispensable. And yet we know that the Age of the Automobile is probably only a phase in the evolution of Western Civilization. Dependent upon fossil fuels, the vehicular paradigm is bound eventually to decline, as we use up existing stocks on the planet. Is it possible to imagine a world in which our dependence upon the automobile is significantly reduced, without sacrificing the convenience and efficiency which it makes possible? As a practical matter, owning and operating and parking a personal vehicle in the city today is becoming pretty burdensome, if not too expensive. Public transportation may be reliable and easy, or unreliable and frustrating. As a commuter from the suburbs to the city for 27 years, I wore out my tolerance for solitary commuting by car, and by bus (AC Transit), and by commuter train (BART). Any system you have to take five days a week becomes a drag. Could I, would I ever, have considered commuting by bicycle? In my case, it wouldn't have worked. Many people today are coming by necessity or interest to believe that bicycles may be the answer to the problems that vehicular traffic in congested cities present. Riding a bicycle is healthy, and certainly cheaper than driving. In other parts of the world, bicycles and motorcycles are much more common. In Europe, and in the Far East, bicycles are much more widely used. And with that greater use, comes an entirely different set of problems with which to deal. Biking advocates in Europe have formed pressure groups, and engage in public protests referred to as Critical Mass. In the San Francisco Bay Area, we have become accustomed to (if not comfortable with) monthly Critical Mass protests. In theory, encouraging people to ride bicycles instead of driving their cars is a good thing. In reality, within the context of how our world works at present, there are limits to how much biking our current transportation system can accommodate, without becoming as crowded and inconvenient as it can be with automobiles alone. We are probably in the midst of a transitional phase in our transport systems, from one primarily dominated by private cars, trucks and busses, to one in which there are more two wheeled, human-power vehicles on the road. In the news this week have been attempts in San Francisco to get a law passed--based on the so-called "Idaho rolling stop" law--which entitles cyclists to pass through Stop Signs, and proceed slowly if there is no cross traffic. These "rolling stops" are designed to make cycling easier, and to prevent the police from ticketing riders who do it. As we all know, cyclists today rarely obey traffic regulations, so passing this law might in effect be nothing more than an acknowledgment of what already happens. When I was a boy, no one paid much attention to bicycle regulations. No one wore helmets, bikes often rode on sidewalks, and usually didn't come to a full stop at stop signs. We lived in a simpler world, then, when people believed that cars were the answer to all our transportation needs. Bikes were for kids, a toy and a recreation. If you want to imagine what might some day happen in America, if the bicycle revolution continues to gather steam, check out the traffic jams they have in large cities abroad. In India, for instance, or Rome, or other urban areas where bikes have become common. Advocates for the new "rolling stop" ordnance demand that we accommodate their openly scofflaw behavior by making it legal to ignore current traffic law. In my experience--admittedly anecdotal--cyclists--in the Bay Area, at least--have become cocky and "in your face" about their refusal to follow the law. Engaging in Critical Mass protests, designed deliberately to cause distress and aggravation among motorists and the citizenry generally, has done nothing to further their cause. Perhaps believing they occupy some moral high-ground, they seem to think they not only don't have to obey the law, but that they have a duty to do whatever they can to antagonize motorists and pedestrians alike. Looking a little way into the future, it isn't difficult to imagine what may be coming to our urban streets. As bicycling grows in popularity, the congestion and jostling once associated exclusively with automobiles, will become several times worse, as two- and four-wheeled vehicles, and ordinary pedestrians vie for ascendancy in an increasingly crowded urban matrix. In that context, no one will have any moral leverage against another, since the compromises we have made to accommodate one faction, will end up making everyone unhappy. It's another confirmation of the old adage "be careful what you wish for." If you believe that converting, say 50% of all private vehicles to bicycles, it's doubtful that the result will be to anyone's liking, particularly in crowded cities. 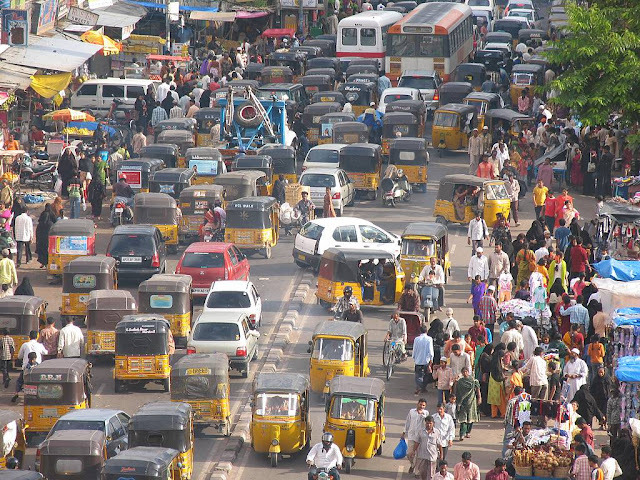 I may be entirely naive, but I believe that problems such as urban congestion, are but one of a number of consequences, or symptoms, of crowding brought on by excess population and uncontrolled growth. 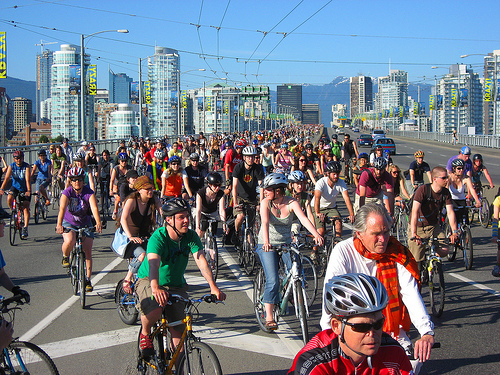 The "critical mass" which bicyclists like to think of as a tipping-point for the trend away from unwise reliance on automobiles, is actually one such symptom. Choosing to ride a bicycle, because of necessity (it's all you can afford), or pleasure (riding for fun or exercise) does not imply that biking represents a superior vision of our future. Bicycle coalitions and cocky, in-your-face cyclists deserve to face the same realities as drivers and pedestrians. The answer to congestion isn't in fighting people over shrinking space, but in seeking solutions that reduce demand, and that begins with population control, and regional low- or no-growth initiatives. If we fail to find ways to moderate our rapacity and unwholesome breeding, none of the temporary stop-gap measure are going to matter. In the meantime, we'll continue to see the majority of cyclists blasting through intersections at 30 mph, oblivious to signs and pedestrians and motorists alike, flipping everyone the bird, screaming and wobbling willy-nilly into adjacent lanes, and generally raising hell. Allowing cyclists to ignore traffic regulations won't make them (or anyone else) safer. It will only make matters worse.